(Latin: “goddess from the machine”) a person or thing that appears or is introduced into a situation suddenly and unexpectedly and provides an artificial or contrived solution to an apparently insoluble difficulty. “Dea Ex MACHINA: the Power of Women” is a digital collage series that references the biblical stories of Judith, Jael, Susannah, Delilah as well as the legend of Saint Irene and Saint Sebastian. Playfully, I search the Internet for copies of their likenesses (predominantly painted by wealthy, white, and male artists, save for the Holy works of Artemisia Gentileschi) before proceeding to slice, erase, and layer these images until the feminist gestures of these women are powerfully revitalized with new context. In this way, I turn to digital collage as a weapon of subversion. Presenting these works, I reflect on my desire to explore art-making that is seemingly devoid of a human / Artist's touch. 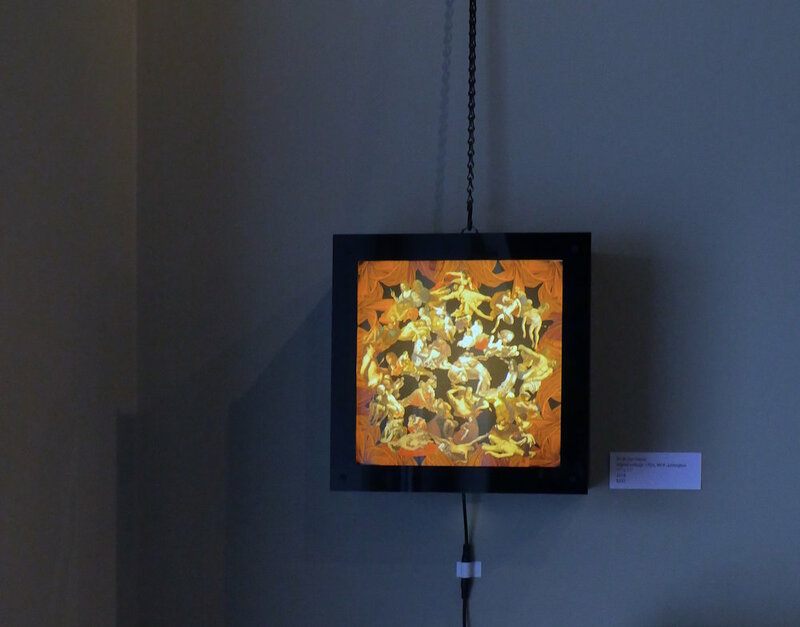 Each image here has been copied from the Internet, obliterated then remade in Photoshop, printed by machine on plastic paper, framed in Plexiglas and illuminated by electricity. I marvel at the manner in which my relationship to machines is not only wholly dependent, but also increasingly creative. W. Benjamin once famously asked, “What is art in the age if mechanical reproduction?”, to which I reply what is and can art making be the age if synthetic reproduction / imagery / reality?